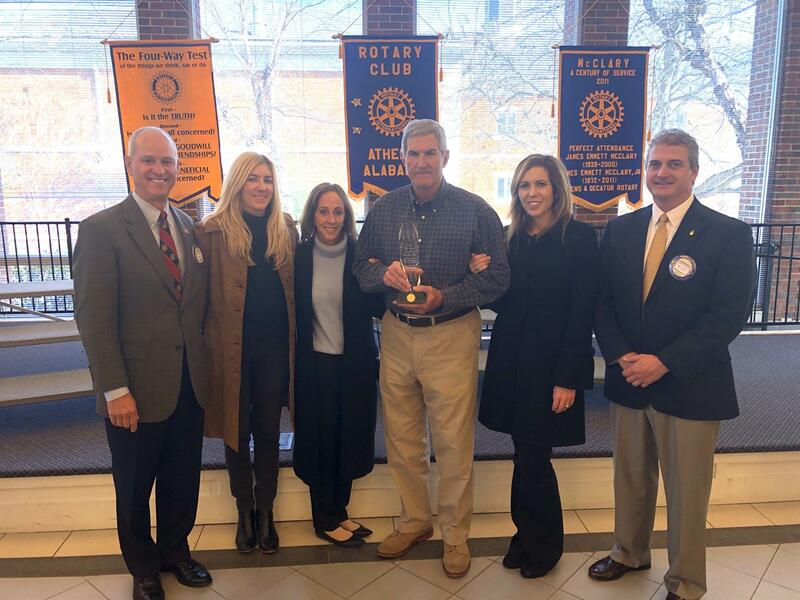 On Friday November 16, 2018 the Athens Rotary presented its Martin-Young Lifetime Achievement Award to Bill Strain. 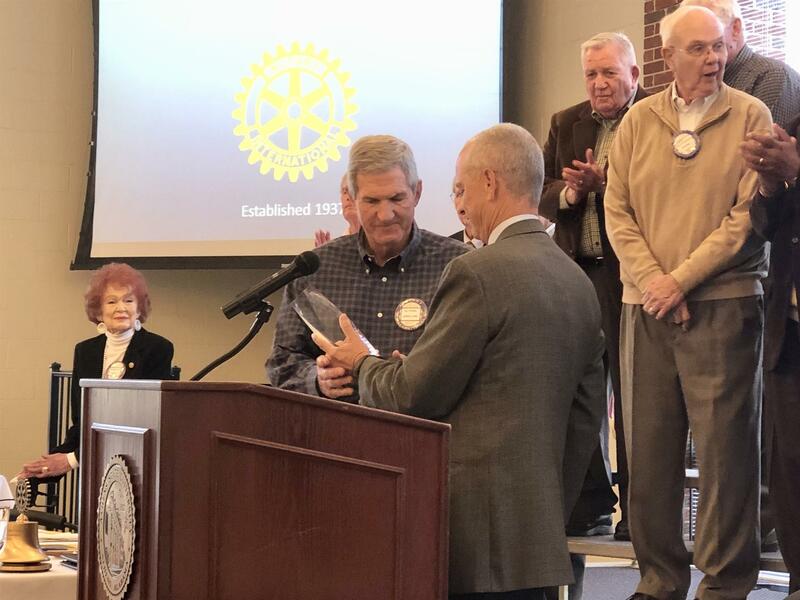 The Martin-Young Fellowship is awarded by the Athens Rotary Club to one of our very own for lifetime achievement in the service of our community. 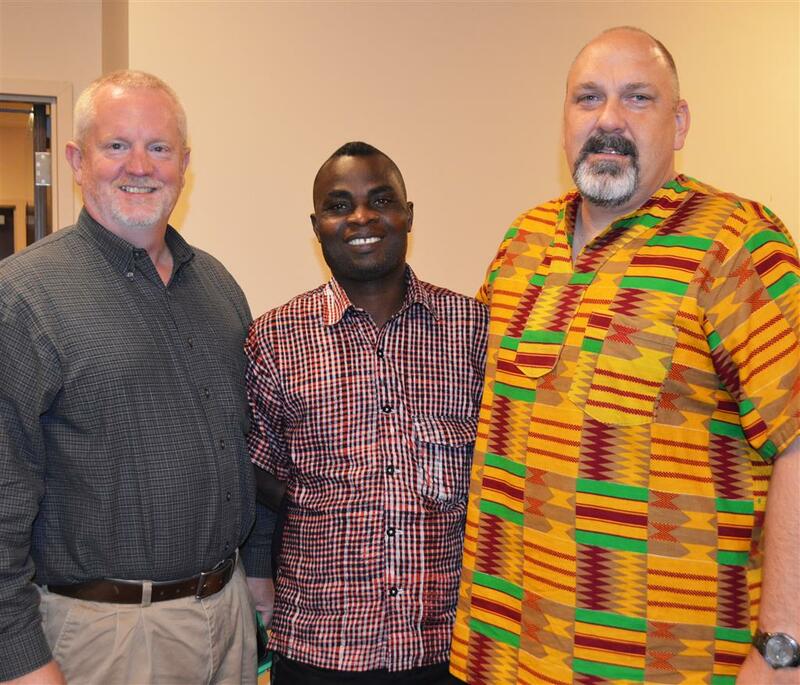 The Martin-Young Fellowship also includes a donation by Athens Rotary to The Rotary Foundation in the amount of $1,000 in honor of the recipient. 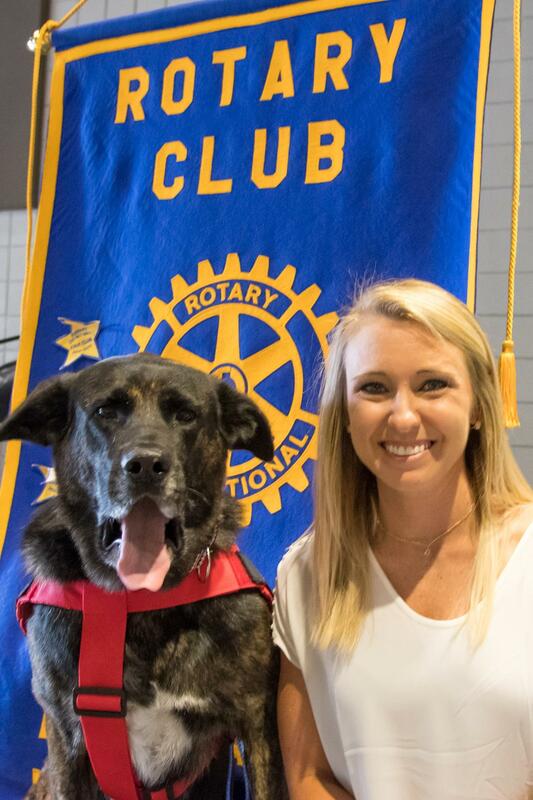 The Athens Rotary Club had a visit from a ninja on August 27, 2018. 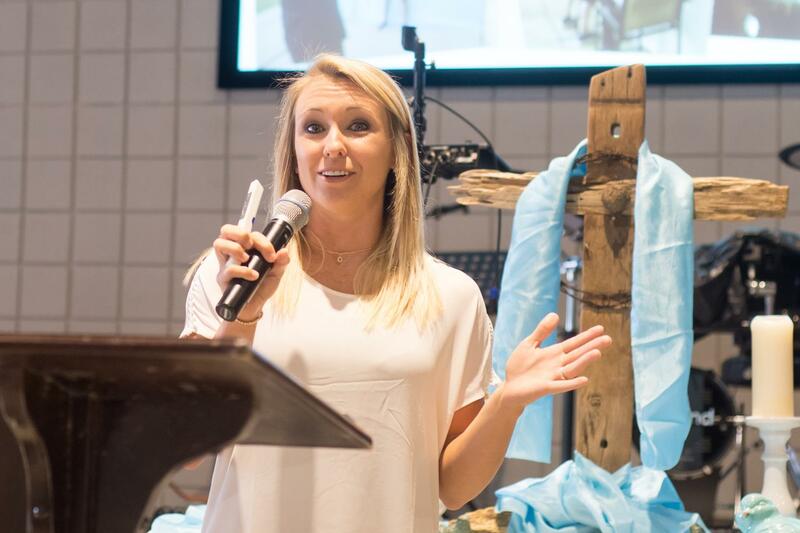 Megan Dillard is a math teacher in the Athens City School system who recently competed at the national level on the TV show American Ninja Warrior. 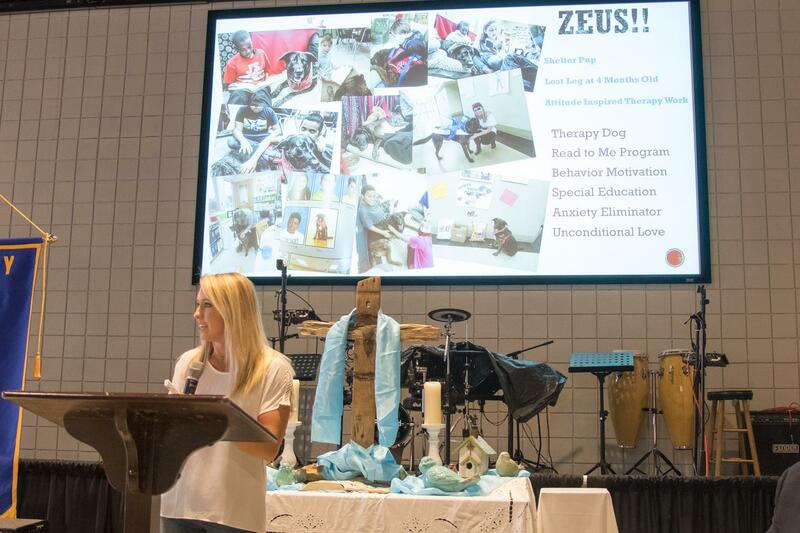 Megan shared the inspiring story of not only the two years of grueling physical training, but also the story of her amazing therapy dog, Zeus, and the impact they have had together in the lives of local school children. 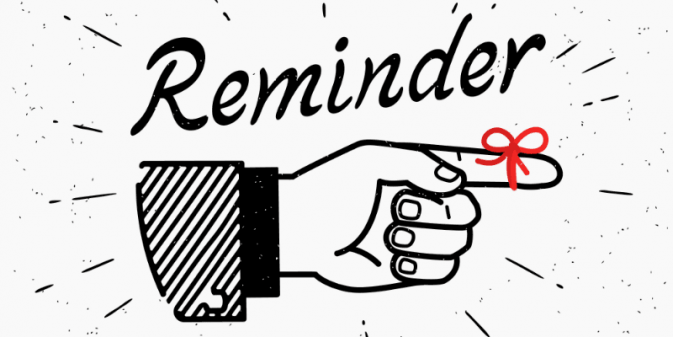 Don't forget - Our club will meet at the Beasley Center Friday August 17th at noon! 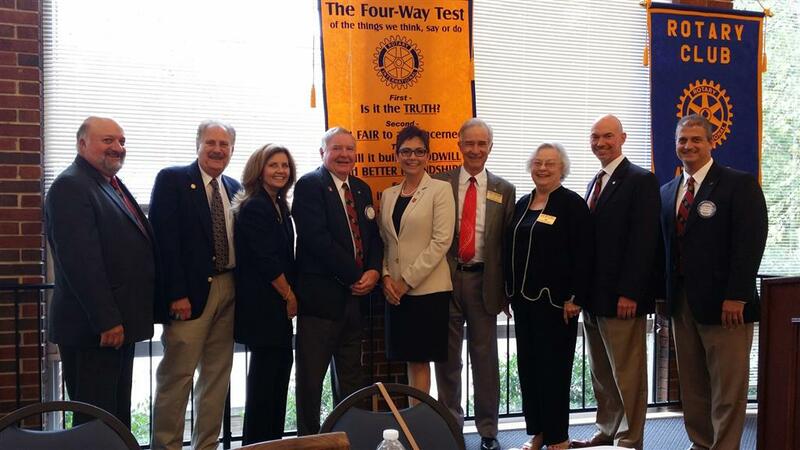 Rotary District 6860 Governor Carol Argo visited the Athens Rotary Club on July 27, 2018. Carol shared her Rotary story as well as her theme for this year, "Lean, Serve and Celebrate." 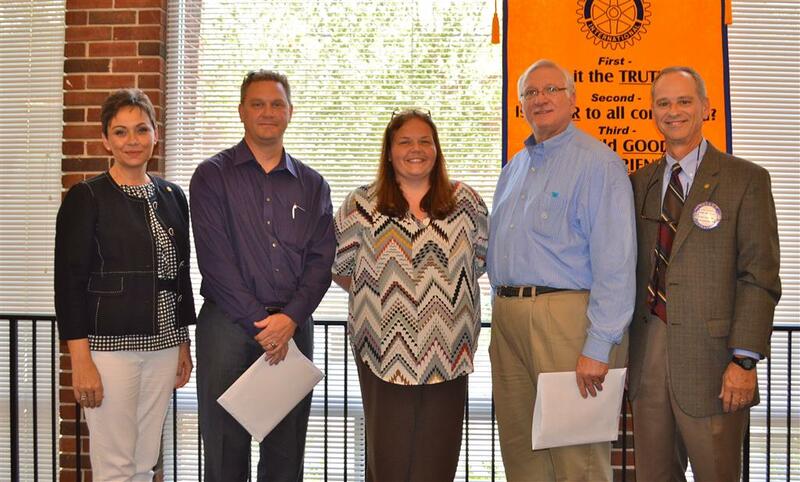 She met with the club's Board of Directors to discuss the club's goals and objectives for the new Rotary year. 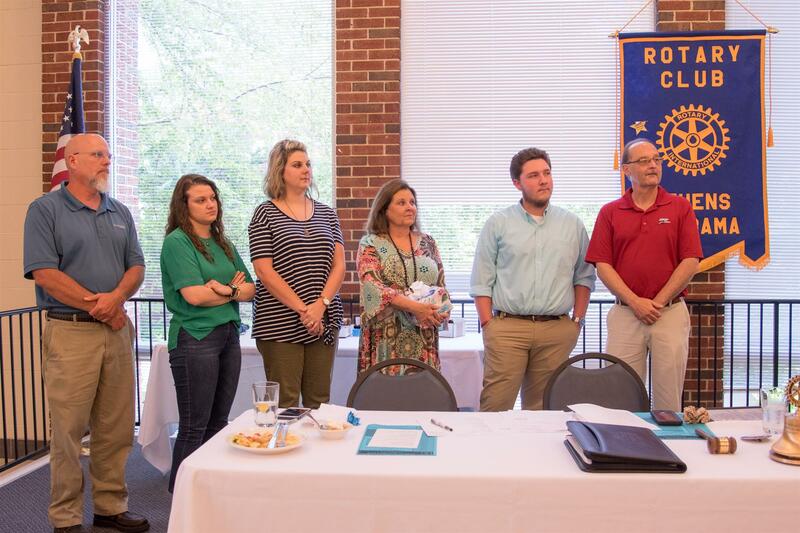 On June 29th, 2018 the Athens Rotary Club celebrated the end of the one Rotary year, and the beginning of another, with it's annual Awards Day. 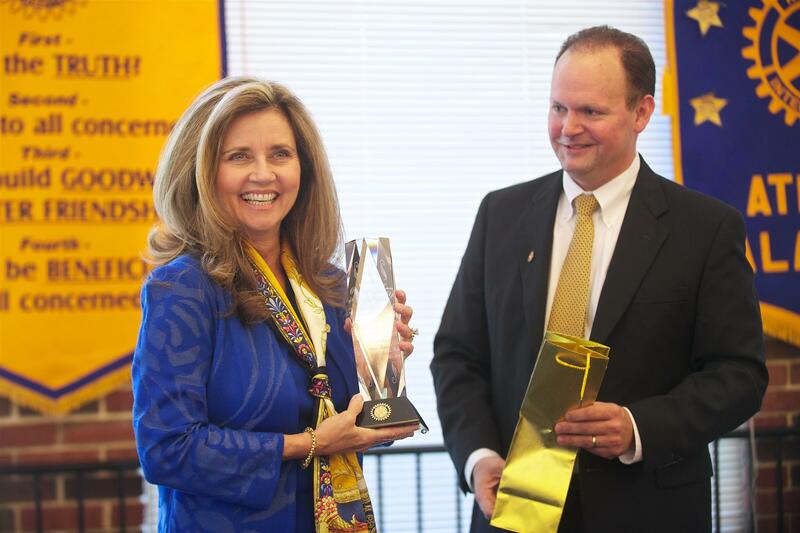 The club honored the late Martha Jo Leonard with the renaming of the club's Service Above Self award in her name. This years Martha Jo Leonard Service Above Self award was presented to her family. At the conclusion of the meeting, 2017-2018 President Barry Hamilton passed the gavel to incoming President Barry Hickman. 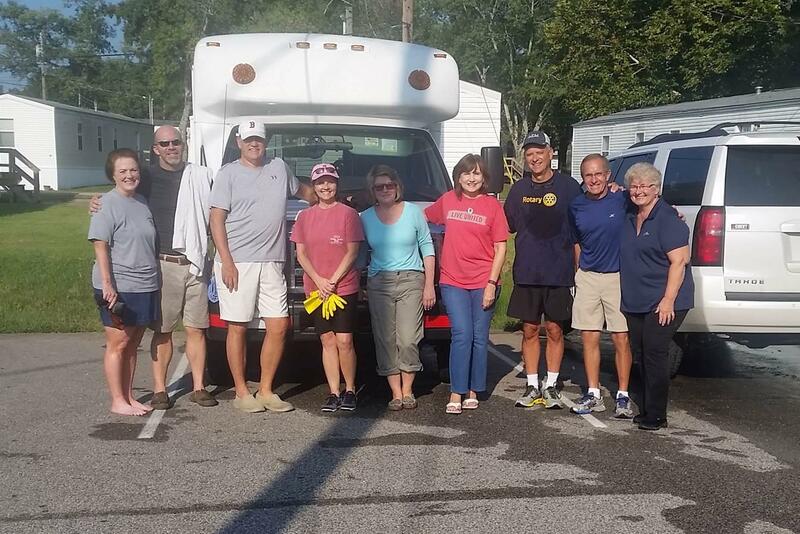 Athens Rotary participated in the United Way’s Week of Caring on September 21, 2017 by washing buses for the Athens Limestone Counseling Center. 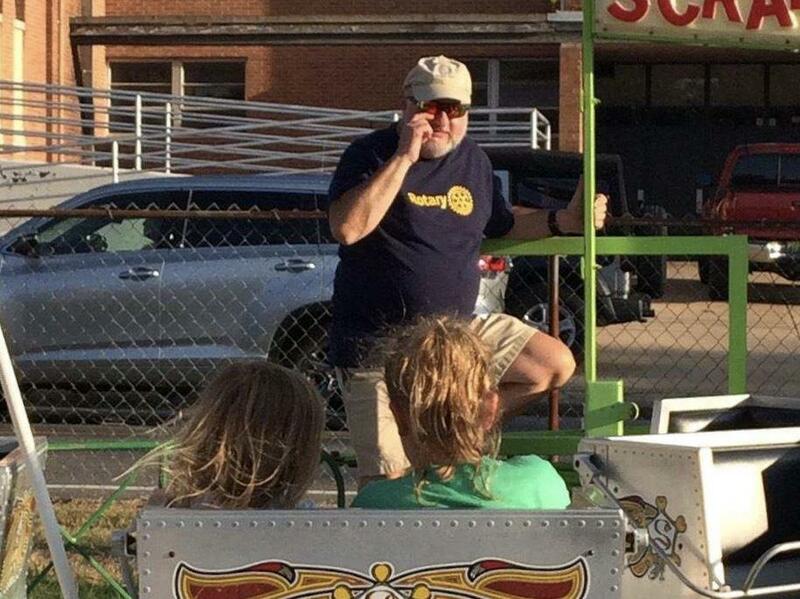 The Athens Rotary Club is proud to support our community though the Athens Police Department’s Operation Childs Play. 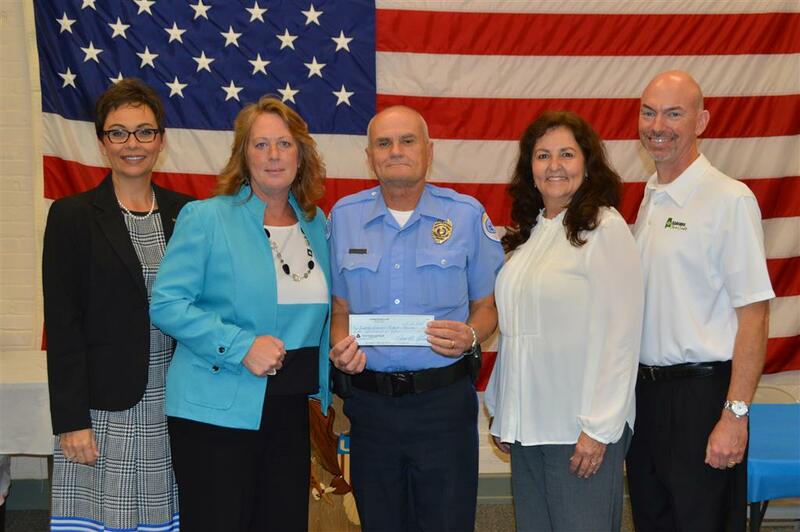 Athens Rotary recently presented a check in the amount of $2,500 to the Athens Police Department to assist in the purchase of equipment for Operation Childs Play. 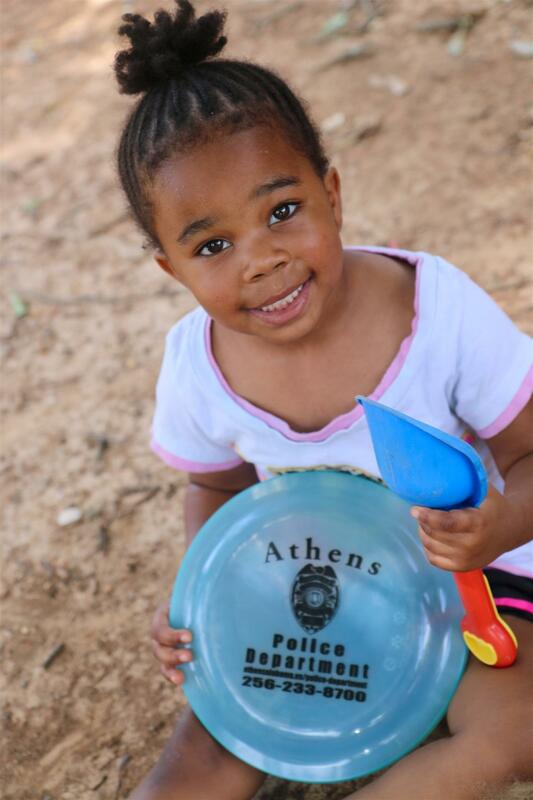 The goal of the program is to foster understanding, trust, and build relationships between the community’s youth and Athens Police officers. 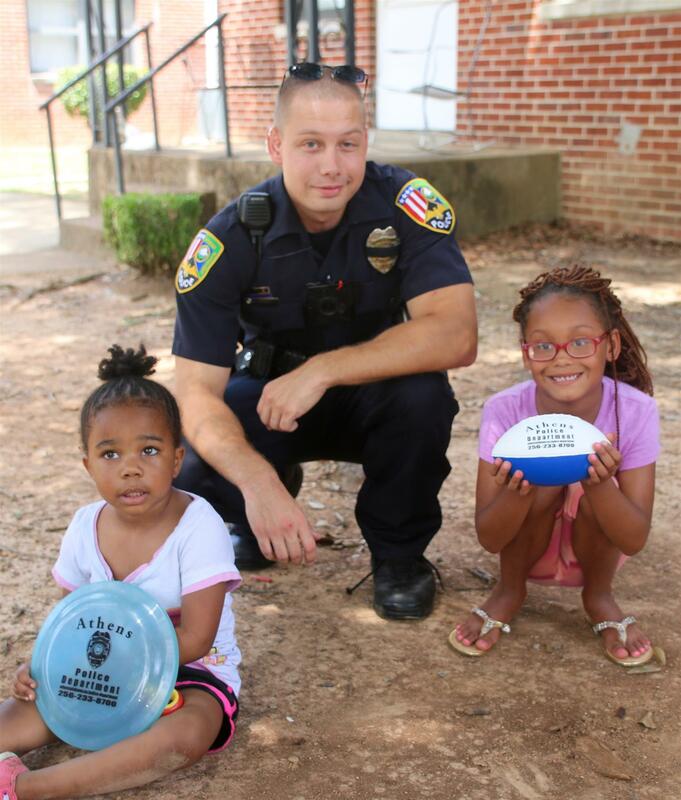 The officers are provided with balls and Frisbees with the APD logo and phone numbers. Officers are encouraged to not only distribute them but to join in a game with the children. 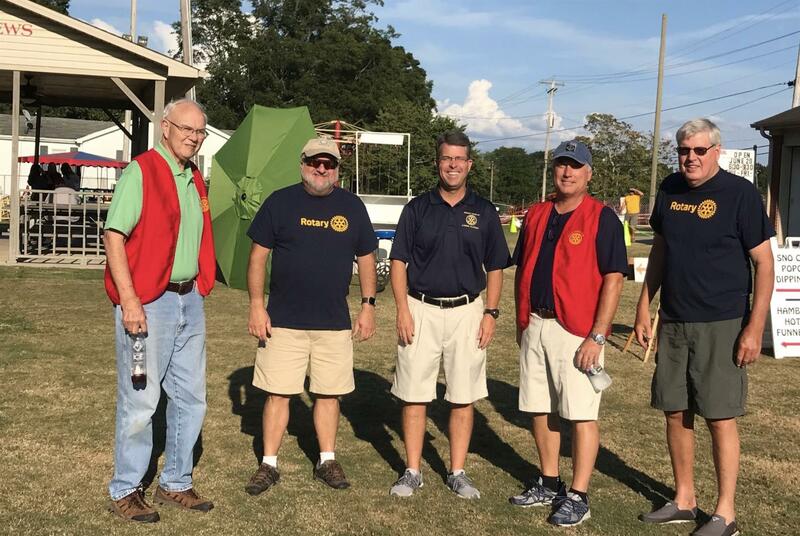 "The Athens Rotary Club is pleased to have an opportunity to sponsor this program with the Athens Police Department,” said Athens Rotary President Bill Ward. 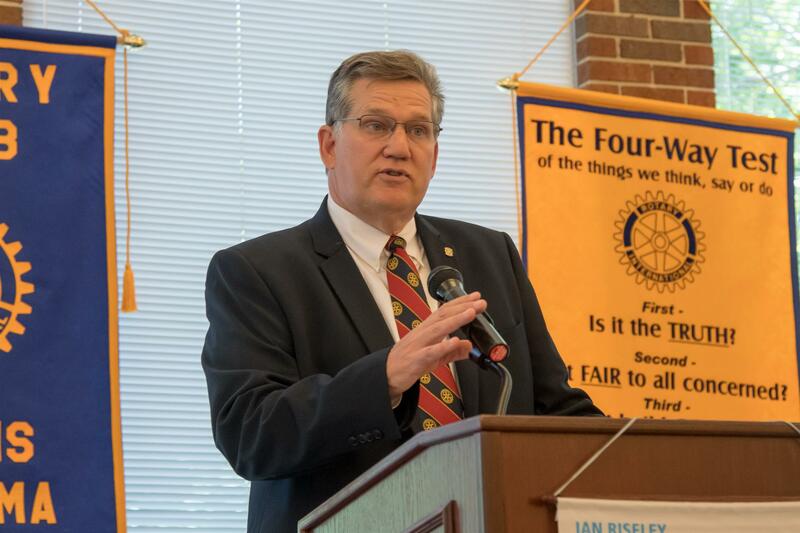 “Working together in our community and around the world to promote peace and understanding through service and stewardship is the cornerstone of Rotary Clubs worldwide." 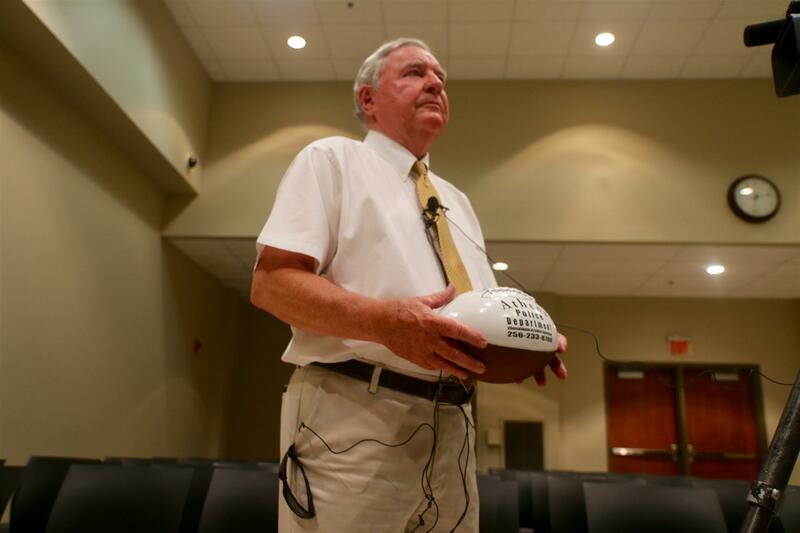 “We appreciate Rotary thinking outside of the box with us so our department can continue to enhance respect and dialogue between officers and citizens of all ages,” Athens Police Chief Floyd Johnson said. 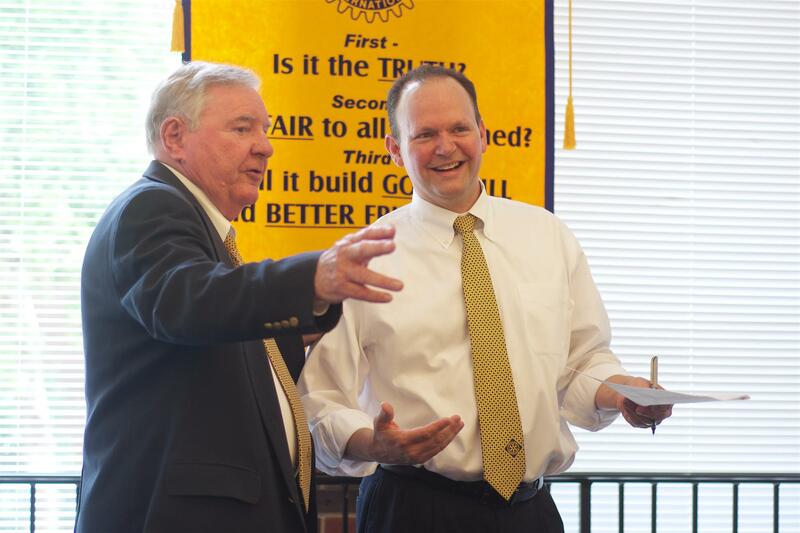 The Athens Rotary Club celebrated its annual Awards Day on June 24, 1016. 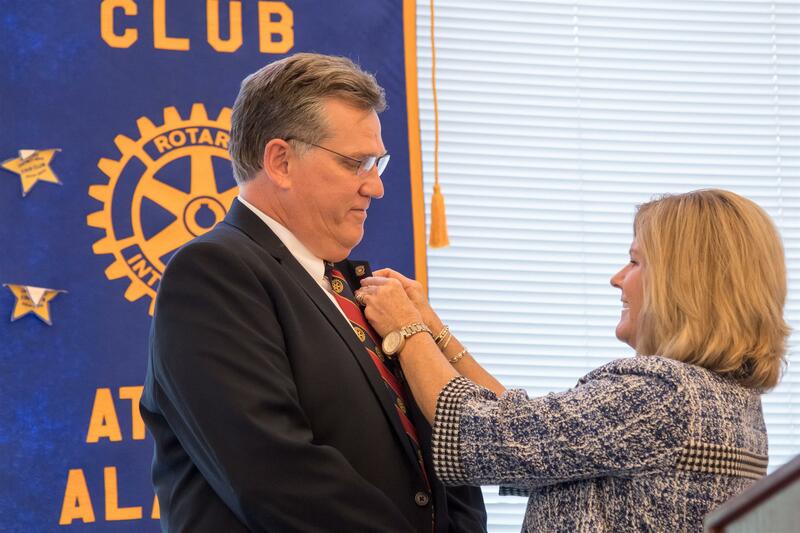 Tere Richardson was honored as the club’s Rotarian of the Year and 2015-2016 President Shane Black passed the gavel to Bill Ward. April 15, 2016 Meeting at "Leak City"
Our April 15, 2016 meeting will be held at the Leak City training facility located at 807 East Sanderfer Road. 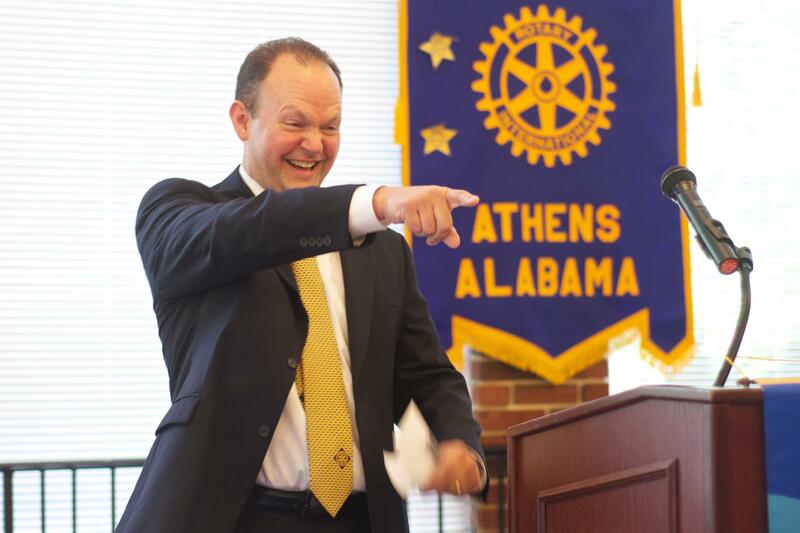 The Athens Rotary Club is pleased to be able to support our local Fully Tummy Project. The Full Tummy Project identifies students in area schools who are, or may be, at risk of hunger. 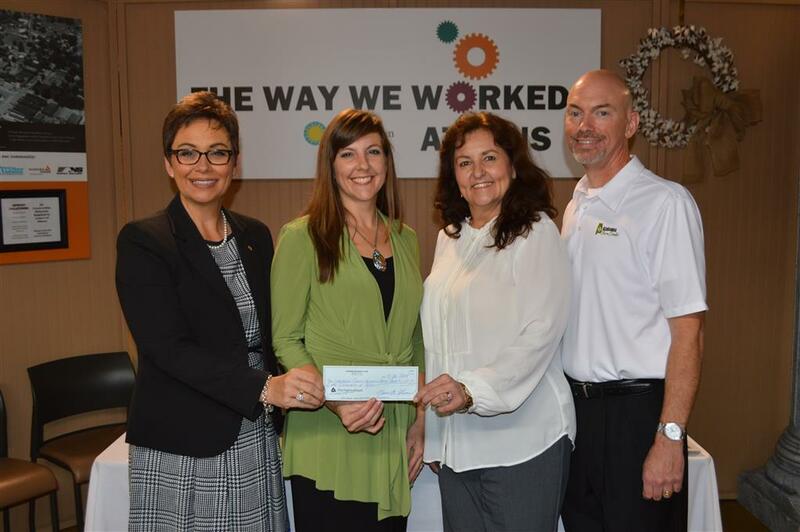 The Athens Rotary Club received a grant from Rotary District 6860 to assist the Club’s support of this worthy project. 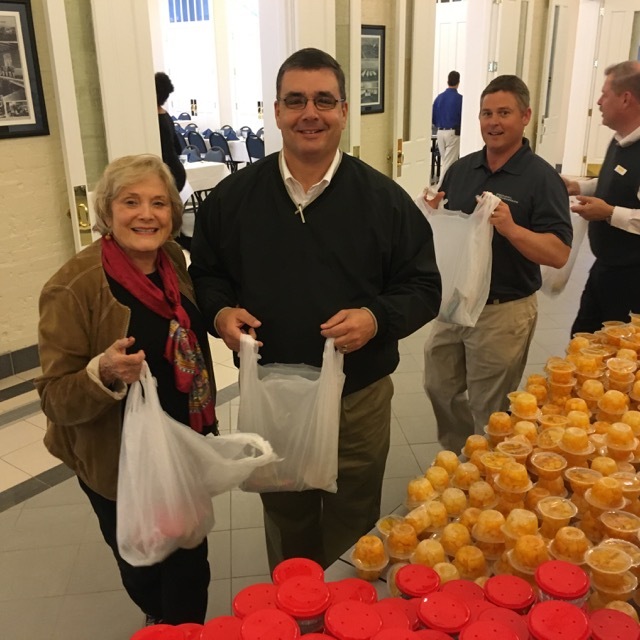 This year the Athens Rotary Club will be supplying food for between 192-200 students in the Athens City School System during the month of January. 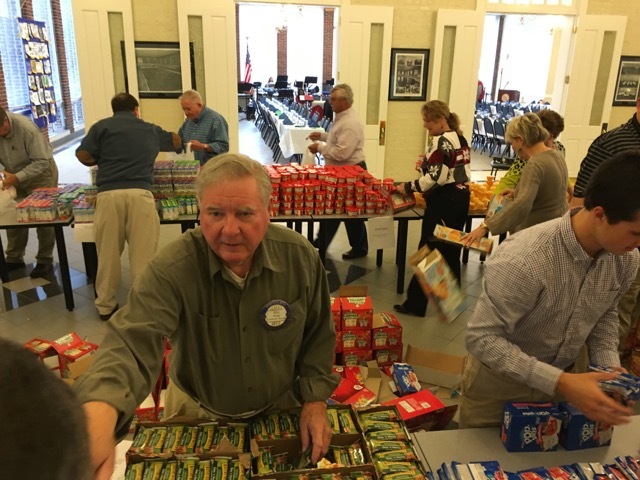 At the Club’s December 11, 2015 meeting all members present assisted in packing 800 bags of food to be distributed by Rotary member to local schools in January. 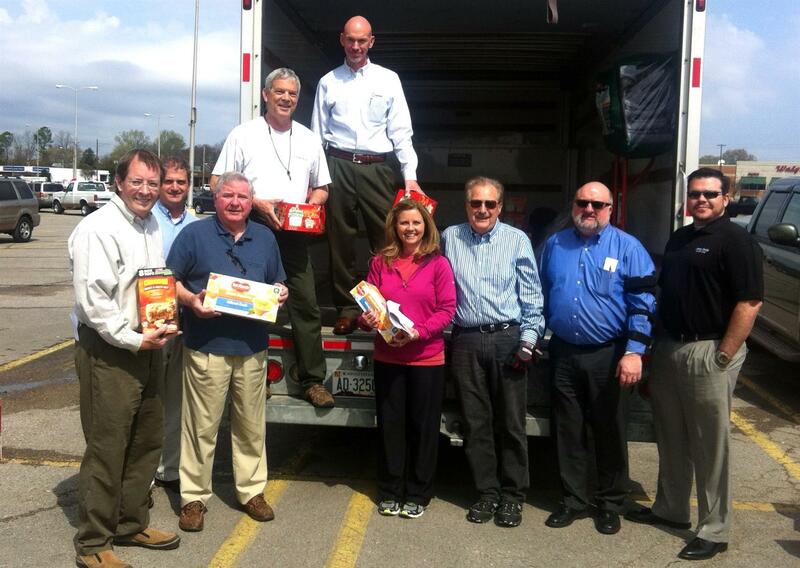 Rotary members and guests packed approximately 8,800 items in under two hours. 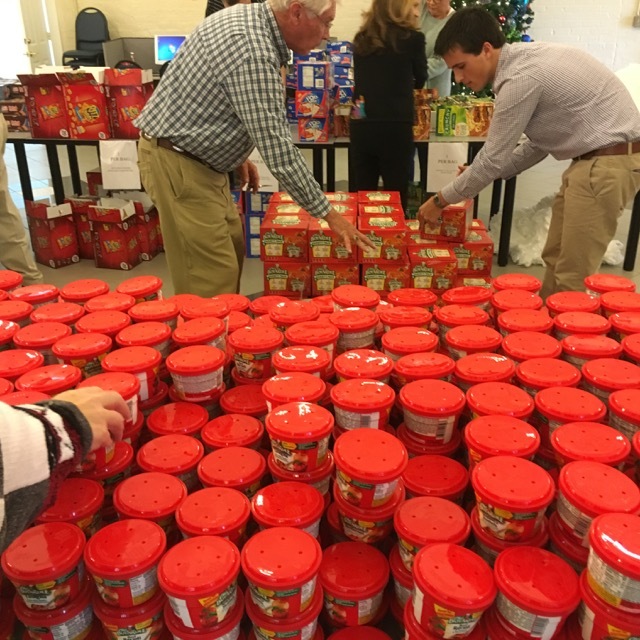 Items included 1,600 cans of microwavable meat and pasta, 1,600 fruit cups, and hundreds of servings of juice, granola bars, and breakfast pastries. The Club will undertake a similar project in the spring involving County schools. Thank you to everyone who participated in this project! 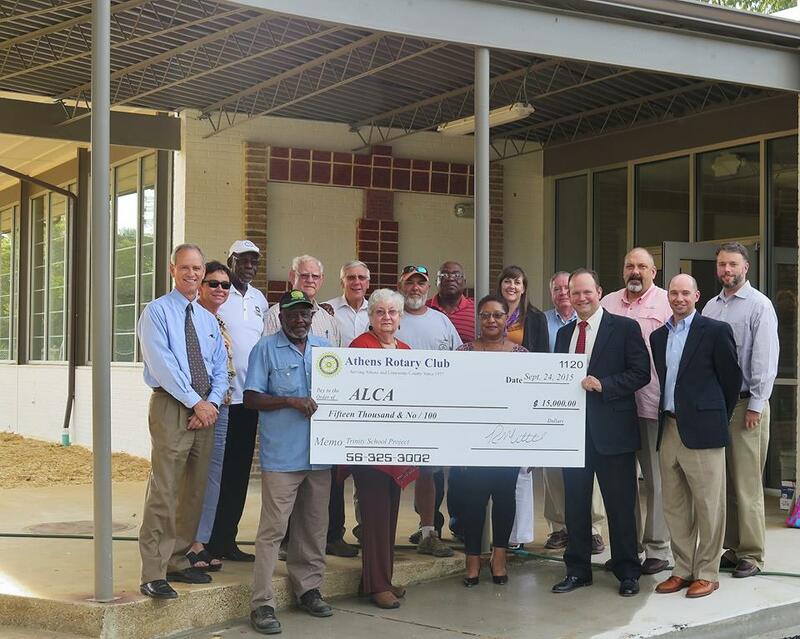 The Decatur Daily has a nice article about the Trinity Community Center project, including the $15,000 contribution that Athens Rotary made towards side landscaping. 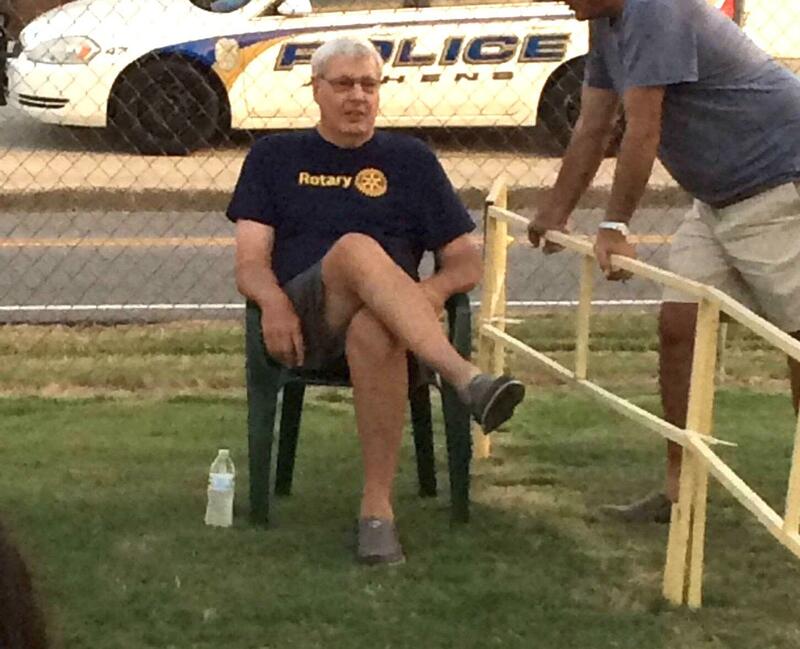 Athens Rotary also adopted the landscaping duties as a service project. 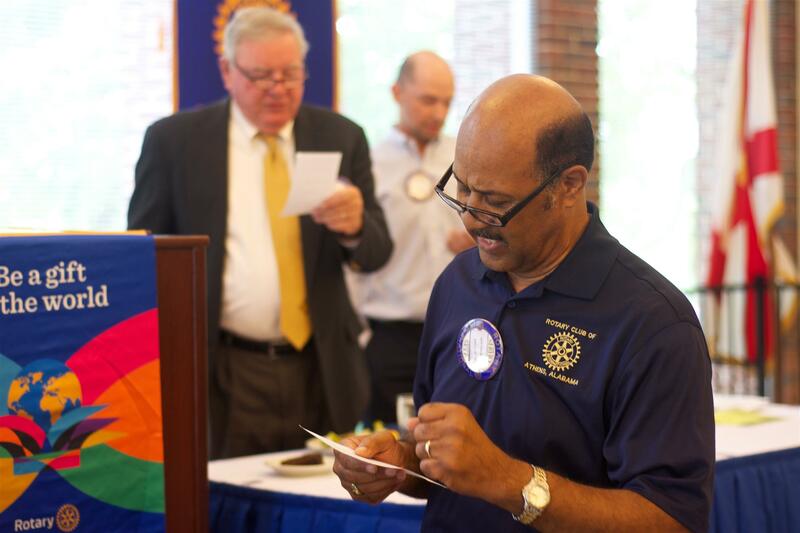 The article includes several pictures of our Rotary Club at work in our community. 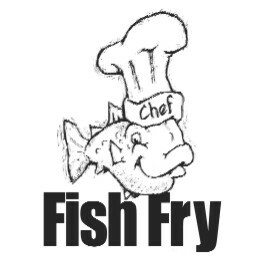 Don't forget that we will meet at Emmanuel Baptist Church on April 24, 2015 to support the Alabama Veterans Museum through their annual fish fry. 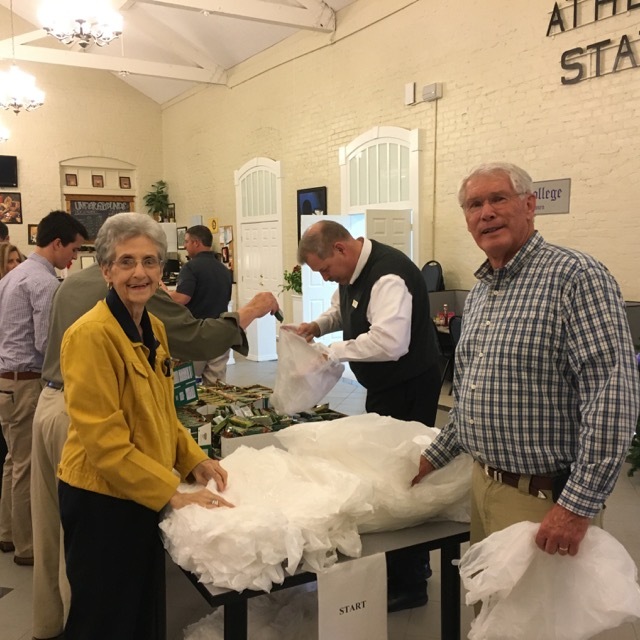 During the month of December, Athens Rotary Club filled bags for the Athens City School Full Tummy Project. 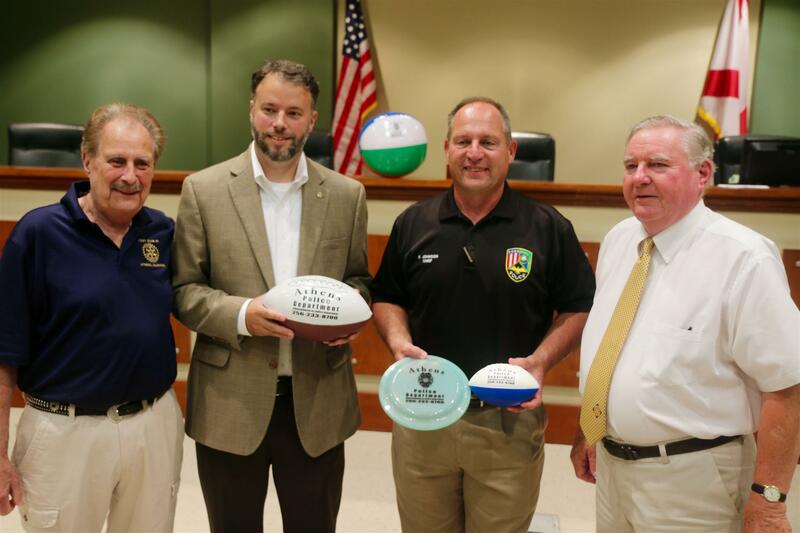 Rotary then distributed them to each city school each Friday in January (Athens Intermediate, Athens Elementary, Julian Newman, Cowart and Brookhill). 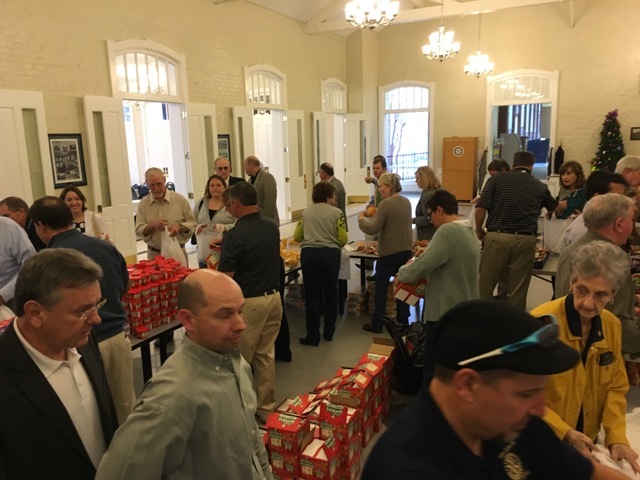 The second portion of the project was to distribute food items to the county schools for their weekend backpack food programs for elementary children at risk for hunger. 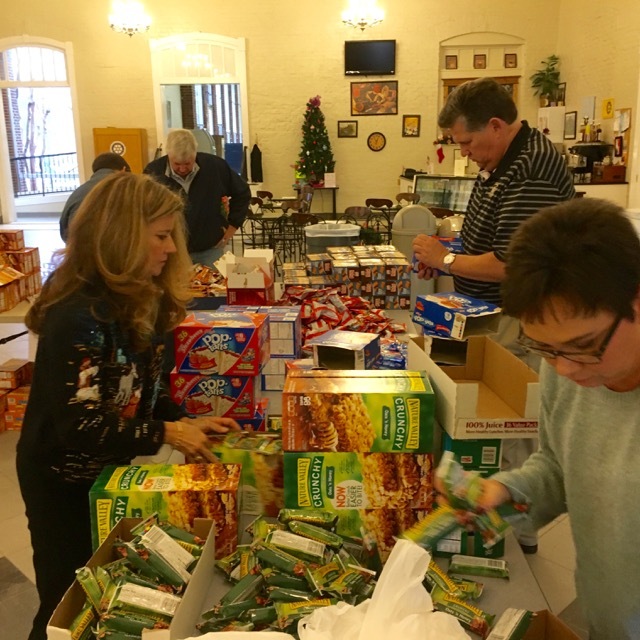 Packages were delivered to West Limestone, Blue Springs Elementary, Owens Elementary, Johnson Elementary, Tanner, Creekside, Cedar Hill and Piney Chapel. 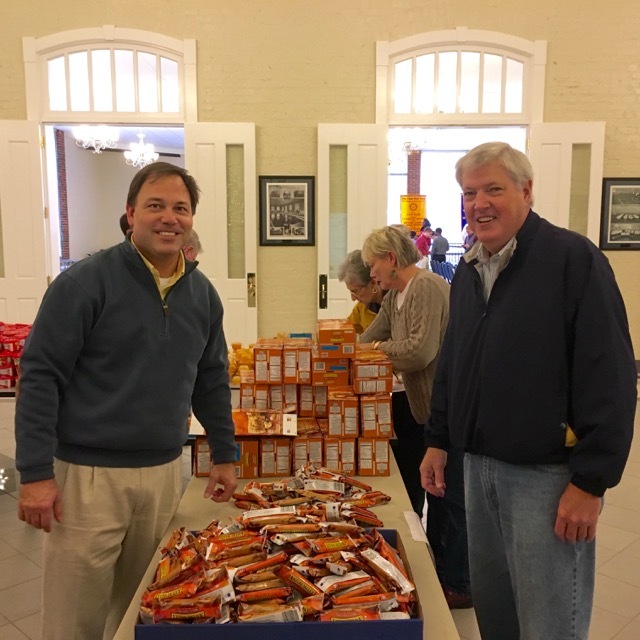 All totaled Athens Rotary Club provided over 12,000 servings of food items such as granola bars, cheese crackers, peanut butter crackers, fruit cups, beef ravioli, juice boxes and pop tarts. It has been a busy week in our club and for our club in our community. 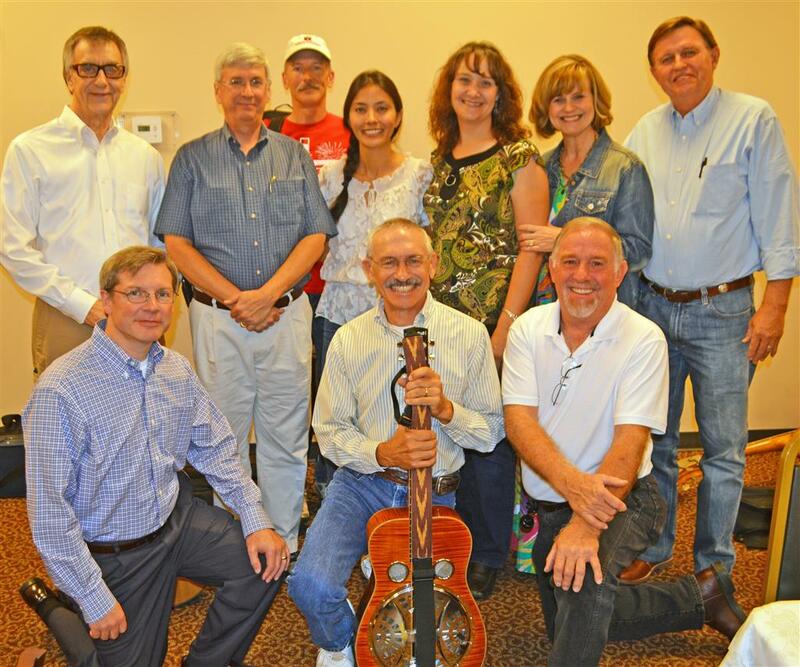 "Just Down the Road" performed at our October 3rd meeting just in time for the Fiddler's Convention. 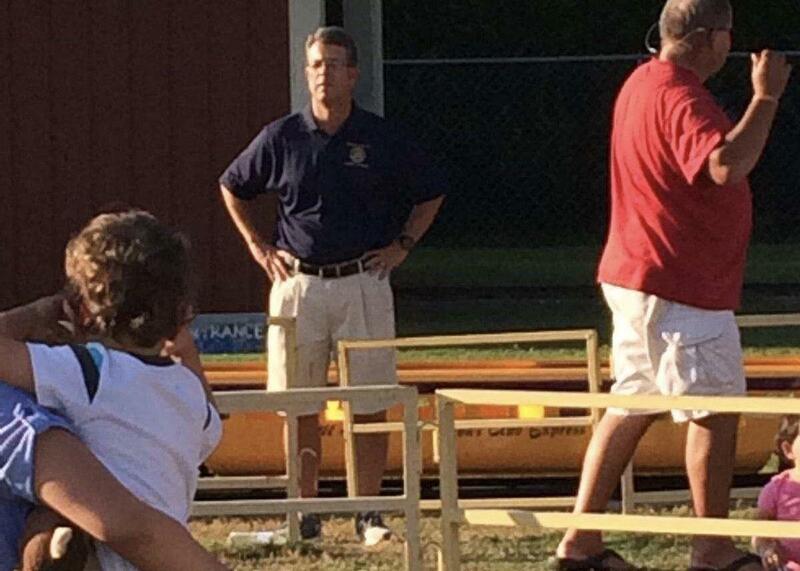 The club also had an international visitor. Thompson Yin, a 23 year veteran firefighter from Ghana, Africa was in Athens learning about our firefighting techniques to take it back to his home department. 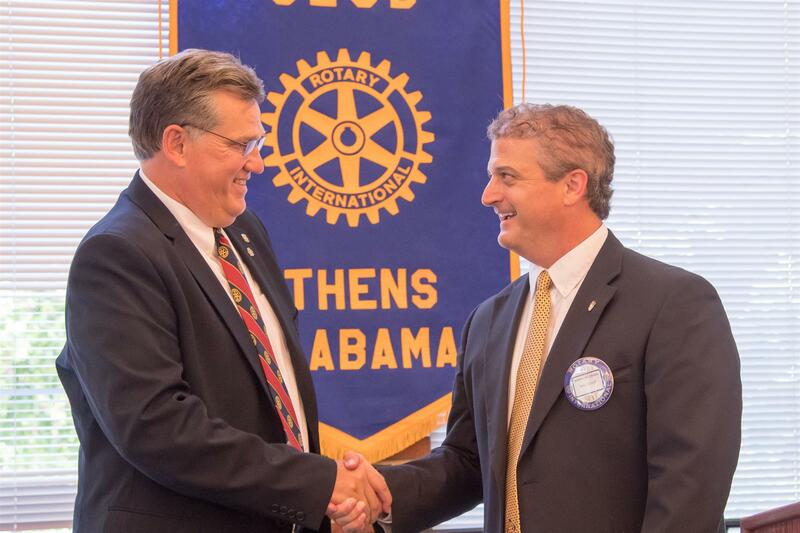 Athens Rotary also presented checks to the Alabama Veterans Museum and the Limestone County Archives. 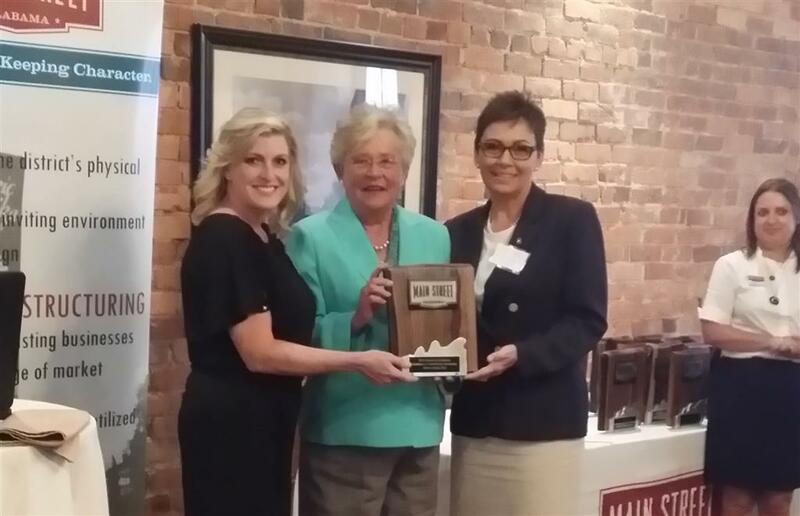 The Athens Rotary Club & The Spirit of Athens have won an award of Excellence from Main Street Alabama. 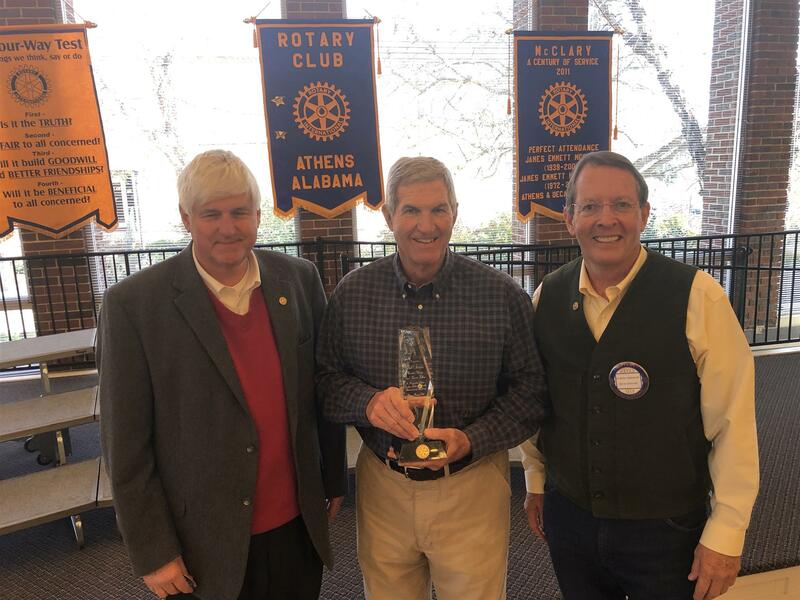 The Excellence in Public/Private Partnerships recognized Athens Rotary and SOA for their joint efforts to beautify downtown Athens though project such as "Pecan Park." Join us for the first "Rotary After Hours" on Thursday September 18th from 5:30pm-7:30pm. 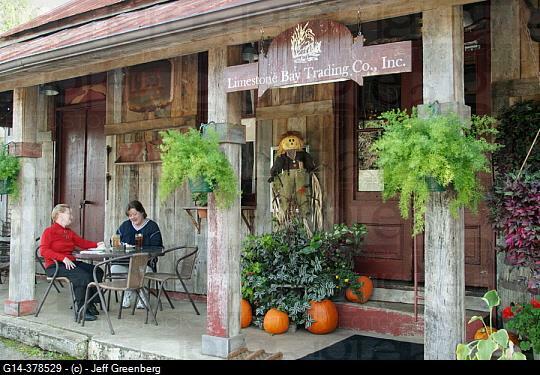 We will meet at Limestone Bay Trading Co. in Mooresville. Bring your spouse or significant other and meet Rotarians from the Huntsville and Decatur clubs. This event will count as a meeting makeup for the Athens Club. 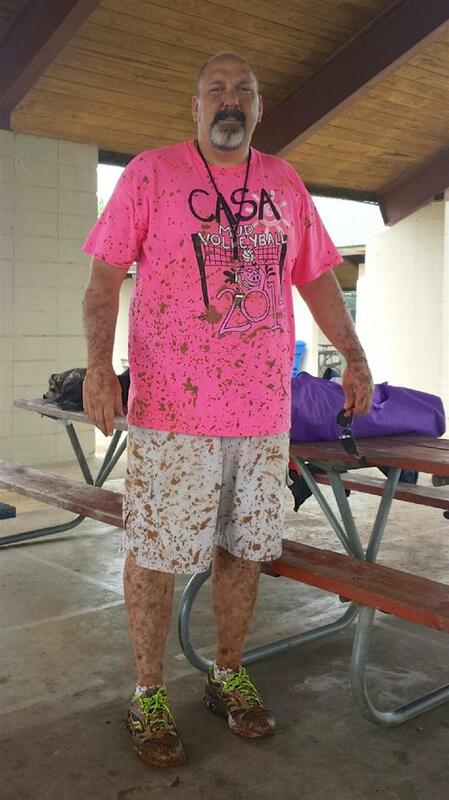 Thank you Bill Perkins, for going above and beyond the call of duty at CASA Mud Volleyball! Volunteers are still needed to help with CASA Mud Volleyball (Saturday July 19th), and the Rotary International Day of Service at the Birdie Thornton Center (Tuesday July 29th). Please e-mail Tere Richardson at tereannr@aol.com if you are able to serve. Our club was fortunate to have a visit from HK Derryberry and Jim Bradford this past week. HK wants to keep in touch with all of his friends via facebook. 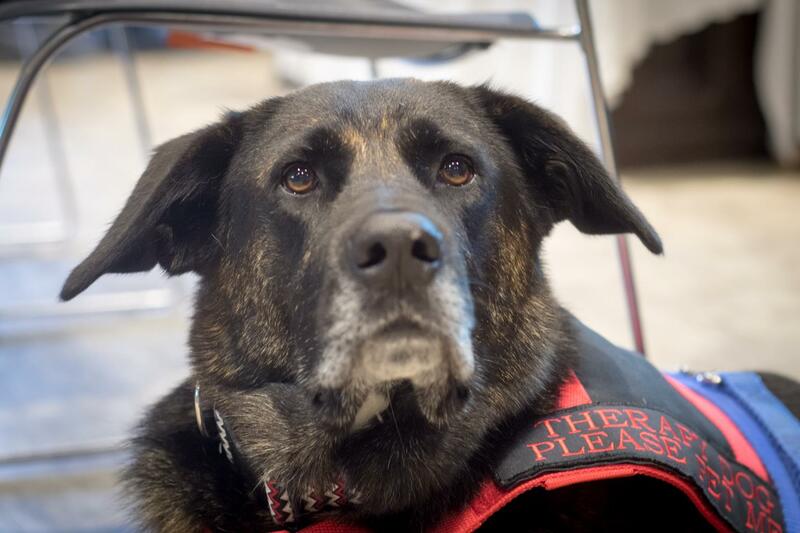 He currently has about 1,100 followers and is looking for more. 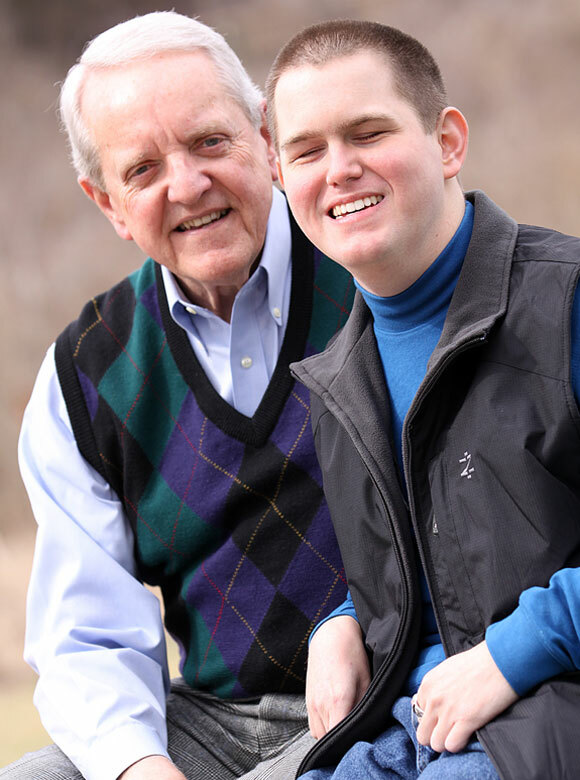 If you are a facebook user you can follow him at www.facebook.com/hk.derryberry. Rotary Awards Night...Featuring "Simon Sez"
Rotary Awards Night will be held Saturday June 28th. The evening begins with dinner and awards at from 6:00pm – 8:00pm, followed by live entertainment from the band “Simon Sez.” The band plays a wide range of music from Motown to current day, and they will perform until 11:00pm. Simon Sez are: Drew Carter; Andy Clem; Greg Young; Whitney Young; Jim McDole; and Buddy Carter.